From San Diego North County, the heart of golf manufacturing, Golf Instruments™Co. is proud to announce the introduction of the HP-100 Shaft Puller. This industrial quality tool is designed for removing golf club shafts with optimum speed and performance, while minimizing the chance of damage to the shaft and head. Your return on investment will be quickly realized by saving expensive shafts, and your valuable time. The HP-100 is the first puller robust enough to withstand production use -- so you can focus on making clubs, not fixing pullers. Developed from years of club building experience, Golf Instruments™Co. gauges are made with the sole intention of satisfying the most demanding club makers and pro shops. 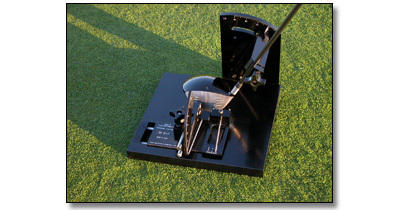 The manual and the analog M-310 provide superior precision in fine tuning and customizing clubs. With a feel and accuracy unique to the industry, they enable manufacturers and pro shops to attain higher quality control levels than ever before. If you would like more information on the HP-100 Shaft Puller, or the complete line of Loft-Lie Gauges, contact Golf Instruments™Co. at the address on the top of the page, or e-mail Golf Instruments™Co.